When Steve Lecklider returned to the third generation family farm his grandfather, Ralph Lehman, ran for 50 years, he decided to give the fruits and vegetables grown there a new twist. And so he started producing dried fruits and vegetables and mixes such as Cherry Berry, a combination of dried cranberries, cherries and blueberries. Today, Lehman's offers over 40 different value added products including nut butters, original trail mixes and dried fruits. The farm prides itself on producing fruit that is sustainably grown using integrated management and organic growing techniques. 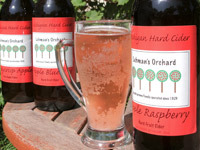 From the estate grown fruits they make fruit wines, and award winning hard ciders.